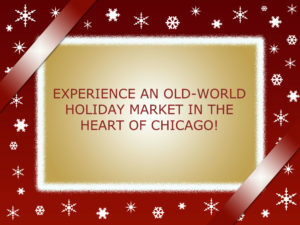 Now celebrating its 22nd year, the Chicago Chirstkindlmarket is a cherished tradition, bringing old world German and European traditions to the heart of the city. This very special holiday event is taking place now through December 24, 2017. Stay just north of the loop at City Scene B&B and you can easily take a train or bus to the downtown event. Popular in Germany for centuries, Christkindlmarket takes its name from the Christkind, a folklore “angel” who wears gold and white robes and a crown, and leaves presents for children under the Christmas tree. Chicago’s Christkindlmarket is a large open-air holiday village with candy-cane striped booths and vendors selling all sorts of handcrafted items. One-of-a-kind hand-blown glass ornaments, German nutcrackers and cuckoo clocks, jewelry, home décor and wooden toys are just a few of the many articles you’ll find there. Vendors will also be selling a delicious array of sweet and savory foods, such as sausages, potato pancakes, roasted nuts and pastries. A special treat is Glühwien, a hot, spiced wine that is a tradition of German holiday markets. Order one and you’ll get it served in a souvenir holiday cup that’s shaped like a boot. Musical acts are scheduled daily, offering even one more reason to bring the family for a visit. In addition to Christkinlmarket’s main location downtown, you can enjoy a market and events in Naperville—a suburb just north of Chicago. Or head to the north side to the Rink at Winterland at the Park where you can ice skate in the shadows of Wrigley Field and take in special holiday events. Sunday – Thursday, 11:00 a.m. – 8:00 p.m.
Friday – Saturday, 11:00 a.m. – 9:00 p.m.
December 24, 11:00 a.m. – 4:00 p.m.
Make your base for all the festivities at City Scene B&B, where you can book a private suite that has one or two bedrooms, sitting room, kitchen and bath. An eclectic mix of furnishes, fireplace in the sitting area and a steam shower in the bath make it a super cozy place to stay. City Scene B&B is a member of the Illinois Bed and Breakfast Association and offer a unique lodging experience! This entry was posted in Food and wine, Holidays, Illinois Bed and Breakfasts and tagged Festivals and events, Holiday event, Illinois B&B's, shopping by admin. Bookmark the permalink.